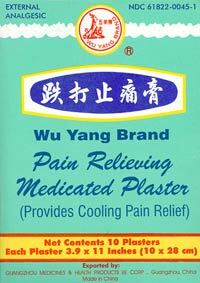 The Wu Yang Brand Medicated Herbal Plaster is a relabeling of a product that had long been sold as Yang Cheng Brand Plaster for Bruise and Analgesic. It is originally a product of the United Herbal (Pharmaceutical) Factory in Shaxi town of Zhongshan City in Guangdong (Canton). This factory produces a wide range of herbal products, and is especially known for its menthol-based formulations, such as this plaster, their Fritillary and Loquat Extract (a cough syrup), and Yin Qiao Jie Du Pian, a tableted remedy for cold/flu. The plaster has a cloth backing and the herbal material is in a thin layer that is slightly sticky, so it adheres to the skin, but is still easy to remove. There are 10 plaster sheets per box, and they can be cut to fit the desired area. 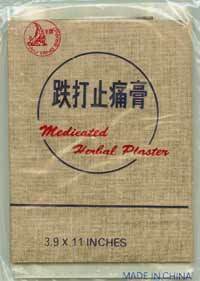 The plasters can be retained on the skin for 24 hours, after which they lose potency. This formula is based on a recipe used by martial arts practitioners to help recover from injuries incurred during practice sessions. It is indicated for neuralgia, rheumatoid arthritis, spasms, swelling and pain, bruise, sprain, and fracture. A key element in this formula, aside from the penetrating aromatics, is daemonorops resin, known as "dragon's blood." It is the red resin of a palm tree (a young one is pictured here) that is commonly used for treatment of injuries. 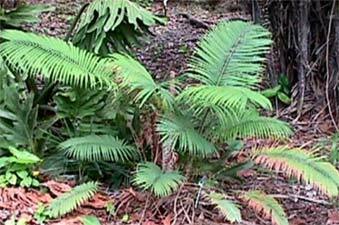 It is reputed to aid break down of clotted blood and promote regrowth of damaged tissues. Menthol is the main active ingredient of peppermint oil (Mentha piperita). It is used internally and externally for treatment of inflammation, spasm, and pain. 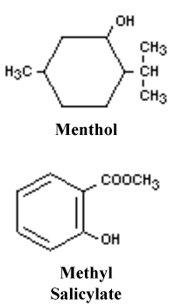 Menthol, after topical application, causes a feeling of coolness due to stimulation of "cold" receptors by inhibiting calcium ion currents of nerve membranes. 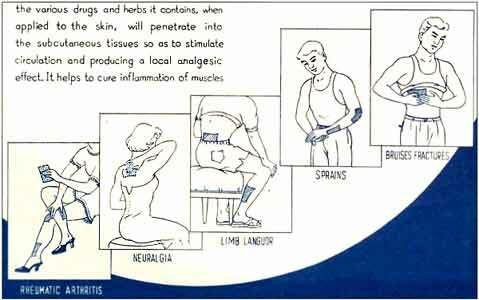 Its analgesic properties are mediated, in part, through activation of kappa-opioid receptors, which help block pain signal transmission. Methyl salicylate is the main active component of wintergreen oil (Gaultheria procumbens). This is used as a flavor, for making a "cooling" sensation in the mouth, and as a topical therapy for pain. This compound is related to salicylic acid that was the original basis of aspirin (acetyl-salicylic acid). Like salicylic acid and aspirin, it has some blood thinning properties and could interact with Warfarin. The inclusion of dipsacus and drynaria in the plaster formula is to help treat fractures and damaged tendons. These two herbs are commonly combined together for this purpose, often along with myrrh, daemonorops, and carthamus.